Are you ready to start diving into some weight pulling activities with your dog? That’s amazing! Dogs and humans can create wonderful bonds, and testing out some of these types of activities together can strengthen that bond even more. It is important to remember though that your dog is not an all-mighty warrior just yet. As their owner, you are responsible for finding the best dog pulling harness that will work efficiently without risking injury to your dog. However, how can you know which harness will provide just that? With our simple buyer’s guide and the top five recommendations of 2018, we are sure that can find the perfect fit for you and your dog. 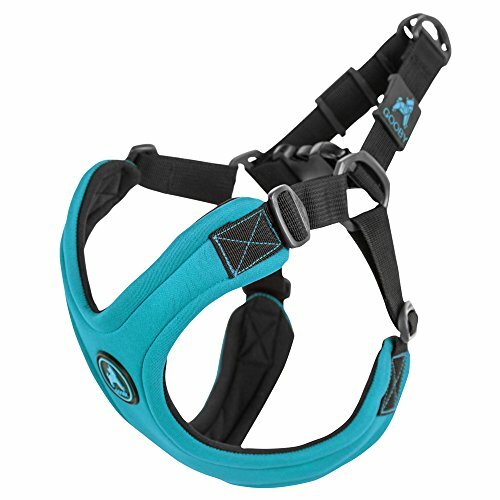 First up on today’s list of high-quality pulling harness options is this one from Canine Equipment, which takes a new twist on H-back harnesses for pulling activities. 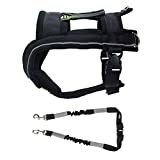 This H-back harness is a good option for anyone who needs a harness to evenly distribute weight through their dog’s chest and shoulders while they are pulling. It has super thick padding in these areas to ensure that your dog feels comfortable while they pull. Additionally, the padding helps prevent slipping or irritation. This particular harness is available in many different sizes, so it should be easy to find the right fit for your dog. The sizes fit as follows: Small (18 to 26-inch girth), Medium (23 to 31-inch girth), Large (29 to 39-inch girth), and X-Large (34 to 46-inch girth). Since the sizes overlap a bit, you can find a few options depending on your dog’s weight. The adjustability of the fit and the leash attachment locations on this harness are handy. Since you can loosen or tighten the straps in some areas, you can get the perfect snug fit which will help your dog and you. Another bonus of this particular harness is that it has a safety release shackle. If you have your dog pulling you on skis or another type of transportation, you can use this safety release to detach yourself quickly, should you lose control of your dog. It happens, and you’ll want to do this to keep you both safe. The sizing can be a bit confusing depending on the breed of dog that you have. If you have a dog that is between two sizes in girth, consider if they have a long or short body. Depending on that, you should go up or down in size. Another drawback of this is that it is not very absorbent or water resistant, so it can take a long time to dry. Avoid getting it wet or you will have to wait a good while to use it again after it is wet. While this dog harness was specifically made for dogs who like to escape like magicians, it’s a great pull harness option that can work in a variety of situations. The V-shaped opening on the front of this harness has two major purposes. First, it allows for great movement and gives your dog space to move their body. Second, it takes some of the pressure off of the neck which makes things more comfortable for your dog since the force will instead be shared by the chest. The material on the body parts of this dog harness is neoprene, which is a super-fast drying material. Even if your dog sweats or gets wet while wearing the harness, it will be dry again in no time. Additionally, this harness comes in three different colors and three different sizes. ESCAPE FREE - The harness reduces the space around the back making harder for your dog to escape the harness by backing away during the walk. CHOKE FREE - V shaped opening reduces the pressure off the neck and distributes them through the chest. LIGHT WEIGHT - Neoprene material body is very light in weight and soft in touch. EASY TO CLEAN - The harness is very easy to clean. Just machine wash cold and hang dry. PLEASE NOTE - MAKE SURE THE HARNESS IS PROPERLY SIZE BY CHECKING TO SEE IF THERE IS NO SPACE AROUND THE BACK OF YOUR DOG WHEN PULLED FULLY. INCORRECT SIZING WILL LEAD TO ESCAPING OF THE HARNESS. The main feature of this particular dog harness is that it can prevent even the sneakiest of dogs from imitating Houdini and escaping! As you might know, dogs can sometimes get out of their harness by backing up while wearing it, but this design has less available space, so it is tough for dogs to escape this way. Another nice thing about this harness is that you can use rubber adjustment tabs on the chest and neck areas. By having the perfect fit in these areas, you can prevent your dog from feeling the discomfort that they might otherwise experience. Plus, they’re easy to adjust while your dog is wearing the harness! The biggest drawback of this model is that it runs small, and they only have three sizes available. With the general shortness of the length of the harness, you may have a hard time finding a great fit. Despite this harnesses escape-proof design, the most persistent dogs might still be able to escape if they can twist themselves out of it. The only way to truly prevent this is to tighten it, but not all owners are comfortable doing that. The FrontPet Explorer Dog Pulling Harness is a great option if you want a secure harness that also comes with the pulling leash that you might not have yet. This harness is made from durable nylon and has reinforced stitching that helps to ensure it is strong and secure while your dog is wearing it. Nylon is a great material for harnesses since it dries quickly and should not cause much irritation. This model is a one-size-fits-some kind of deal, but it does have two adjustable straps which you can use to ensure that your dog has a good fit for them. Since many dogs that will be doing pulling activities are in the range of sizes, this shouldn’t be a big problem for most owners. STURDY- Durable nylon and backed with reinforced stitching creates a harness that will be able to withstand any adventure! 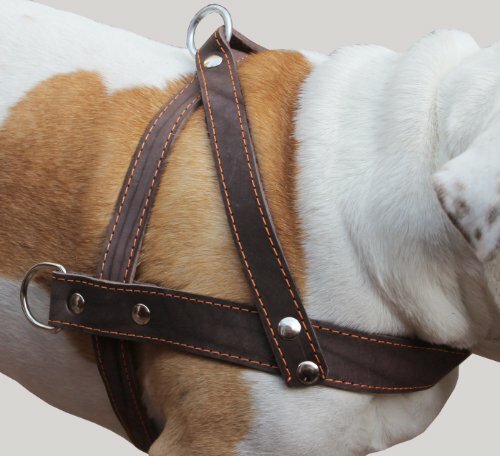 ADJUSTABLE- Two fully adjustable side straps allows you to fit the harness to your dog's unique size in- this ensures our dog will remain safe while pulling! 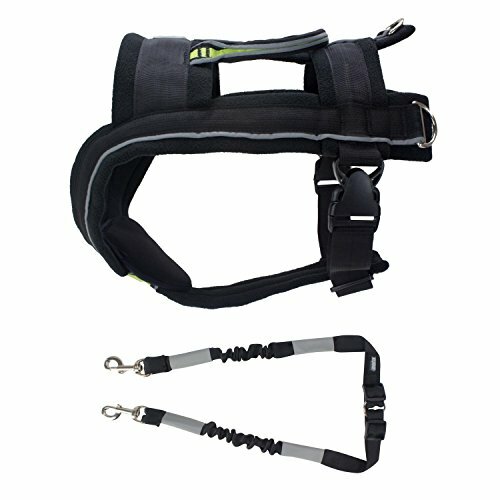 PERFECT DOG HARNESS FOR PULLING- Included pulling harness along with three different pulling D-rings to choose from paired with the ultra tough pulling handle makes this the ideal dog pulling harness! The first great thing that is worth mentioning about this harness is the quality H-shaped design. This design spreads the force out around your dog’s chest so that it doesn’t pull in just one area or cause issues with your dog’s neck. Even when pulling, the harness should adequately distribute the weight. Another great feature is that this particular harness comes with a pulling leash which matches and works well with the harness. With this pulling leash, you can easily set up a test system to see how your dog likes pulling. 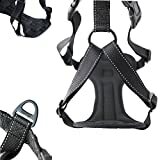 Since this harness is only available in one size and the adjustment straps do not come across the chest area, it can really only be used for a specific size and body type of dog. This might not be your dog, so it might not be the right fit. Another drawback is that the D-rings are not as secure as they could be. If you’re pulling a hefty load or have a super strong dog, you may want to choose something else. The primary function of this safety harness is for riding in a car, but it can double as a basic pulling harness which is a huge plus. This is a simple harness that is available in four different sizes depending on the girth and the length of your dog. It has breathable, lightweight fabric which dries quickly, and all of the attachments are made of sturdy metal so that you can be sure that your dog is safely secured when using it. ALL QUALITY MATERIAL: Top quality metal hardware provides safety and durability. The long-lasting material is proven to be weatherproof and very easy to clean. Breathable, lightweight padding ensures your four-legged friend is always comfortable. DOUBLES AS REGULAR HARNESS: Not just to keep your pup safe in the car! This multi-use harness allows you to take them out of the car for a hassle-free and secure walk or pit-stop. Choose from either the front or the back leash attachment for your convenience. KEEP YOU AND YOUR FURRY FRIEND SAFE: We have included reflective stitching on the harness to improve the safety of you and your best bud on your adventures as you use this multi-use harness both in and out of the car. This harness is made primarily to keep your dog safe and secure while riding in the car, but the harness is also outfitted with the appropriate D-rings to set up a simple pulling system. Thanks to this, you can use this same harness for pulling light loads while training and also keeping your dog safe. While this is a pulling harness in the purest sense, it cannot be used to pull hefty loads due to the thin padding and overall design of the harness. This is a great pulling harness when you are initially training your dog to learn how to wear a harness for pulling, but not for anything heavier. This final harness is a bit unusual in that it is made of leather, but this cool look can work well for the right dog in the right situation. As mentioned, this harness is made of high-quality leather, which is lightweight and durable, so you can be sure that your dog won’t feel weighed down by it while wearing it for months or even years. Another thing to know is that the straps are very wide which allows them to sit smoothly on the dog since they won’t punch up or get stuck on the fur while your dog is moving around while wearing the harness. Allows the dog to have relaxed movement of muscles, makes it flexible and efficient. Lighter weight. Please measure your dog for fit before you place the order. The most notable thing about this harness is the durable construction. It has reinforced stitching, metal D-rings, and great eyelets. All of these things ensure that the harness can stand up to a lot of hard work. The flexible X-shape design of the harness is another excellent feature. It helps to direct the force that your dog is exerting to the pulling lead very efficiently while also being comfortable and safe for your dog. The fact that this harness is made of leather is one of the biggest drawbacks. Leather can take a long time to dry, so it’s not a great choice in situations where your dog will be getting wet. No matter which of these harnesses stands out to you the most at face value, it is essential that you pay attention to specifics of the harness’ design to decide if it is the right fit for you and your dog or not. Not every harness will work, so learn about these attributes before buying. One of the most important things to consider is whether or not the harness is adjustable. Does it have more than one adjustment strap? 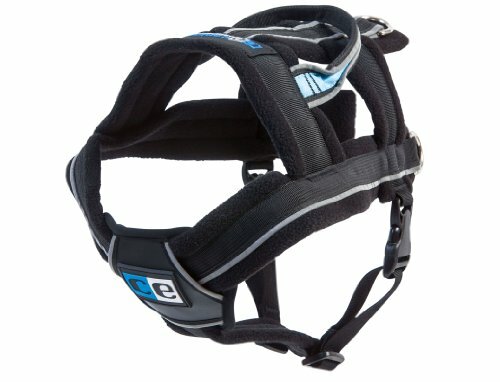 Can you easily change how the harness sits? Does the harness come in custom sizing so that you have a better base fit, to begin with? Answer all of these questions about your harness before you decide which to buy. Adjustability is very important because you want to make sure that you can get a snug yet safe fit on your dog every time. Like your body, your dog’s body will go through little changes from week to week, and you will want to be able to adjust the harness accordingly. Another important thing to consider is the material that the harness is made of. If one of your options is not made of high-quality material, you will probably want to skip it entirely. The material used will decide how comfortable it is for your dog, how durable it is, and even how lightweight it is. All of these factors affect how easily you and your dog will be able to use the harness, which you will see in more detail as we continue through our buyer’s guide. Whether you are doing pulling activities in the rain, sun, or snow, you will want to choose a material that can dry quickly. Your pup’s harness is sure to get wet from either rain, sweat, or snow at some point, and you will want it to dry quickly when this happens. A damp harness shouldn’t be used for prolonged periods with your dog because it can cause skin irritation or rashes that wouldn’t happen if the material was dry. For this reason, having a material that you can dry quickly in most situations will save both you and your dog from a lot of unnecessary grief. This might be an obvious feature to pay attention to, but you will want to find out what load limitations the harness has before you buy it. If you plan to pull a lot of weight, you’ll want to choose a material and harness type that can stand up to that type of activity. The strength of a harness is not only decided by the material type but also by the stitching and overall quality of construction. If the harness is put together without much care, you cannot expect it to work for years to come in the same way that a quality piece of craftsmanship would. As mentioned, when we talked about adjustability above, it is vital that you can get the perfect fit with a harness for your dog. Usually, this means that you need to find the right base size, to begin with. Any high-quality dog pulling harness will have a list of measurements to help you decide when choosing sizes. Depending on where your dog measures in, you will have to pick the appropriate size. Generally speaking, you should go up a size if your dog is within one inch of the top of the manufacturer’s measurements. The final thing that you will want to pay attention to on harnesses when you are trying to choose which one will be best is the clip positions. Since, at first, it can be hard to know exactly where clips should be, try to think about what types of activities you will be using the harness for. If you aren’t sure yet, look for a harness that has multiple clips in different positions so that you can mix it up when you need to. Are you still not sure that any of these dog weight pulling harnesses are right for you, or not yet convinced that you want to invest the money into this type of harness? It might be tempting to make your own harness, but if you’re new to using weight pulling harnesses, this simply isn’t a great idea. Without knowing enough about how these harnesses usually work, you could cause your dog some serious health problems. Once you have a weight pulling harness, you may want to figure out how to train your dog to get used to pulling a sled. A word of caution though; you won’t be able to have them start pulling a sled immediately. Instead, you’ll want to work on training your dog to pull a sled over time by first introducing them to the harness and then to some basic weight. The video below introduces the idea of pulling a sulky, but the process that you will need to go through to train a dog to pull a sled is very similar. When you’re first using a weight pulling harness to a wagon system, it can be a bit complicated even for you to figure out! How do you attach these things properly, and what should you be careful of? Then, connect the harness to the tracers that attach to the front of the cart. If you are modifying a wagon into a cart, it might not have these things, but you should do a little research about how they should be laid out so that you can set it up safely and appropriately for your dog. The best way to choose a dog pulling harness is to follow the steps that we mention in our “Buyer’s Guide” section. Even if you have all of the equipment ready for pulling, your dog might not quite be ready for the big pull. At first, you might even have trouble getting them to put on the harness. Put a small harness on your dog while at home and let them get used to wearing it. Reward them whenever they don’t pull it or chew on it. Begin to take them on short walks, gradually getting longer, with the harness on. Once they are used to a small harness, repeat the process using a pulling harness. Let the dog get used to this harness as a lead or as an accessory for a few weeks before you attempt to add any weight to the harness. Eventually, your dog won’t even notice that this harness is on them! Among these top contenders for the title of the best dog pulling harness of 2018, the Canine Equipment Ultimate Pulling Dog Harness simply stands out above the rest. This harness is stronger, easier to adjust, and generally more useful to those who want to use a dog pulling harness when compared to all of the others. Additionally, it comes in a variety of sizes at an affordable price, so you can make sure that you find the perfect fit.